This interior design project for a young, newly married couple focused on making their large cavernous home chic, warm and inviting, and a reflection of their cultural heritage. “We’re from China, where you really don’t have this kind of space,” says owner Rick Zhu. The house was a wedding gift from their parents, but when they laid eyes on the interior of the 20-year-old house, the couple were somewhat disappointed. In searching for an interior designer, Ariel Zhu said, "Theresa's designs really appealed to us because they feel very European. They remind me of Paris”. Says Casey, “When I first toured the house, the only place that the couple spent time in was the kitchen, where they had set up a card table for their computers. There was no comfortable seating anywhere, no softness, or any reflection of this international couple's style. They didn’t fit with the house.” To get the most impact for their reno budget, we focused on three main areas: the kitchen design, the family room and the master bedroom suite. Overall, the house felt cold, uninviting and soulless. Honey coloured oak paneling and bookcases mismatched with a cherry hardwood floor and dominated the family room, while dated cabinets and a dingy backsplash loomed in the kitchen. The master bathroom was large, but had lots of wasted space. It was dated and uninspired. The master bedroom was enormous, but with no sense of intimacy, had poorly proportioned small trim and a cramped and windowless closet. In the family room, we assessed the paneling and bookcases. The concept for the paneling was not misguided, but some of the proportions and details weren’t consistent. Our solution: a budget-friendly tweak of the crown and the addition of a baseboard to lift the quality of the cabinetry. A game changing soft gray paint transformed this into a chic backdrop for modern furnishings and created a comfortable hangout. The heavy faux stone fireplace mantel was taken out and replaced by a classically proportioned, wood mantel. The uncomfortable antique furniture was relocated to the basement, and replaced with a custom nine-foot sofa and clean white accent table and chairs. A boost of colour from the red “Womb” chair/ottoman completed the transformation. With the kitchen design, we again took a budget friendly approach to updating the existing original cabinets by raising their height to the underside of the ceiling with a horizontal panel/crown moulding in an off-white colour. The client now has the look of a custom kitchen, with the addition of a new backsplash and hardware to complete the updated look. The island was given an overhaul by adding panels at each end to eliminate a dated overhang, then painted steel gray. A new open shelf above the sink allows for displays of vintage items sourced for the client. A complete redesign of the master suite, washroom and closet was necessary to properly achieve the couple's needs and desires. We divided the huge principal bedroom into two rooms, connecting them by a deep panelled archway, which added architectural character. This created a chic, airy sitting room with a new, patterned, marble fireplace and soft floral drapes, hung at ceiling height to make the room feel taller. This opens to a cosy sleeping area featuring a four-poster bamboo-inspired, antique brass bed, backed by a feature wall of delicate floral wallpaper. The walk-in closet is beautiful enough to remain open to the bedroom all the time, but hidden pocket doors were installed if privacy were needed. 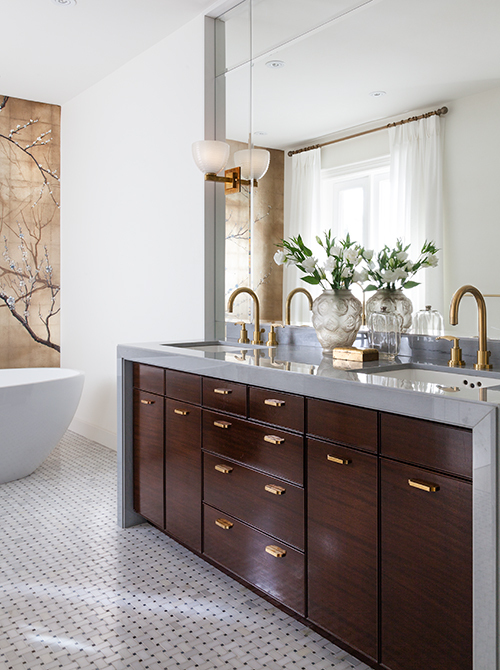 We added a glamorous makeup area that leads to the washroom, which features soft palette, mosaic floors, a dark wood stained vanity, stone counters, muted brass taps and a dramatic Asian inspired mural of cherry blossoms, which became the most loved feature of the house. Says Theresa Casey, “We set out to create focal points - I love the idea that as you walk through the space, there are these rewards and surprises. Rooms are now light-filled and there is a flow from one room to the next. It’s not visible all at once – it has a sense of intimacy that’s appropriate for the private areas of the house”. Says owner Rick Zhu; “In the end we got what feels like a whole new house”.